As many of you know, I started my production carier touring with a Christian band named Crumbacher back in the mid 1980's. During those first seven years, I not only mixed FOH but also road managed and eventually even booked their concert dates. I have remained close friends with most of the members of the band and crew. I was also privileged to work with many other bands from the SoCal music scene. It was a great time in my life and I cherish both the people I got to work with and the immense amount I learned both about my craft and myself. In 2005 Crumbacher along with Undercover, The Altar Boys, The Choir, and 441, all bands that had released albums on the Broken Records label, got together and played a concert in Irvine, California. It was an amazing night and we had so much fun. We recorded the concert on video with the intent to make it available to friends and fans soon after. Getting all the legal signoffs and such took time and well, life went on. The time has finally come and my friends at Take 2 Productions are ready to finish and release this 5 band 3 1/2 hour concert. KickStarter to the rescue. Here is the KickStarter page. It goes live at 9am PST on October 4, 2016. This project really is a labor of love. If you or your parents (yes, I said it) grew up with this music, I guaranty you will enjoy it. Thank you, in advance for your support. Recently I read an article from my former Worship Pastor and friend Rick Muchow titled 28 Things Pastors Should Say to Their Worship Leaders. This article is a fantastic read and you should definitely pass it along to your senior leadership. It was so good that it got me thinking about things Worship Pastors should say to their TDs. Rick has always been a great encourager to me and I have had the pleasure of working with many worship pastors that have encouraged and pushed me to excellence over my 20 years on church staffs. As stated in Rick’s article everyone has different gifting and that can cause communication barriers both with the Pastor/ Worship Pastor relationship as well as the Worship Pastor/ TD relationship. I have written my own list of what I believe, as a former TD, are things any TD can be encouraged by and reminded to do on an ongoing basis, some from Rick, some of my own. 3. People don’t love change, so love people through it. 4. Excellence is a good value, but it should never trump loving people. 8. Your family comes first. 10. Keep your commitments and follow through. 11. Serve other team leaders with grace. 15. Bleed up; your team is not your therapist. 16. People are more important than tech. I recently wrote a post over at WorshipTechDirector.com on service planning from a technical perspective. One of the best ways to have a great service or event is to plan every aspect of it ahead of time. This includes all the technical aspects, preparing for both the actual service and any rehearsals that may precede it. I can’t tell you how many events I have been to that felt like they were cobbled together and where everyone seemed to be running the event flying by the seat of their pants. Great events require great and thorough planning. Not only do such great events go off well, but also their planning beforehand lowers the stress level and increases the credibility level of both the talent and the technical staff. It also increases the chance that you and your team will actually have fun doing what we all love to do. 1) Learn your people’s Love Language. By this I mean that you understand what truly makes each of them feel valued. Caring for those entrusted to you by caring for them the way you want to be cared for, is not very productive, or very Christ like. Jesus cared for everyone he came in contact with differently based on their needs, especially the Apostles (the 12 he spent the most time with). My experience is that when people feel truly valued, even when you have to be tough with them, they will be more willing to sacrifice and buy into the cause. They will also be much more productive, because the work you are having them do is not a “Wild Goose Chase,” but something you believe in, much like you believe in them. What is a personal mixer? Personal mixers give each musician or performer the ability to have an individual monitor mix on stage that they are able to control. If you are still wrestling with whether or not to use In Ear Monitors, Ultimate Ears has a great set of posts about making that move. You can read them here. Ten years ago, the Personal Mixer landscape was very different. There were only a handful of manufactures led by Aviom. The user landscape was also more limited with mostly mid to large size churches using them on par. Fast forward to 2016 and both have changed. Multiple manufactures like Digital Audio Labs, Allen & Heath, Roland, Elite Core, DBX, Behringer, MyMix, and others have joined Aviom in the market. The user base has also grown as prices and ease of use has narrowed the gap. While there is much conjecture on which one to purchase, I have some tips on using them that may help once you have them. So how do most person mixing systems work? For an analog sound console the system has an interface box with a ¼” send and return for each of 16 channels. These send and return to the inserts on whatever channel/ group on the console that you would like to use on that channel of the personal mixer. It is important to remember that this is interrupting the signal path of that channel and is therefore affected by every device in front of the insert point (gain, phase, etc.). Checking the owner’s manual should let you know where in the signal path the insert point is located. The interface box converts the 16 channels into a “digital” signal and sends a copy of said signal down 8 to 10 network cables to each of the personal mixers. Digital mixers that do not have remote digital snakes, meaning they have analog inputs right on the back of the console, usually have some kind of digital card slot for A-net digital network from Aviom. Both Aviom and Allen-Heath will work with A-net along with Pivitec, although the later is not officially sanctioned. If you crank the individual instruments but have the master volume down, you will cause distortion and discomfort. While in a large venue mono may be desirable to make sure everyone hears the same mix, it tends to clutter up an in-ear mix. Use panning to keep things in special perspective. This isn’t the main PA, if you have everything in the mix it gets pretty cluttered. This can muddy up the mix and keep the listener from hearing what they NEED to be able to play and sing with the rest of the group. Many of the mixers have an onboard ambient mic. This can add great space to the mix, but it can also cause chaos. Remember that the ear-buds are only inches from the eardrum and this can cause hearing damage very fast. I love what my friend Randy (a world class monitor mixer) says about mixing for musicians and singers. He uses the S. T. P. treatment. They need to hear their own voice/ instrument. They need to stay in time so they need to hear the snare/ hi-hat/ whatever is keeping time. They need to stay on pitch so they will need the melody. Everything else is just ear candy. If you are on stage once a month, or on a tight budget, these are for you. Entry level pricing is around $100 per set and you can replace the earpiece with cleaning for multiple users. Although the more expensive generics may have duel or even triple drivers, the affordable ones are usually single driver units. They are usually a bit more fragile, but the lower cost make replacing them less painful. And they sound much better than iPod earphones or the drugstore brand that makes you look like a pirate. If you use earphones every week or more, you really need to invest in custom molded earphones. While it is a larger investment, the benefits far out way the sacrifice. They are also better for your hearing and your physical ears. There is no generic that can beat the sound of a good quality set of custom molded IEMs. Prices range from $400 to $1800 plus getting your ears molded at an Audiologist. You can save that money with Ultimate Ears as they have patented a digital ear scanner. You can find more info on this here. DON’T USE THEM for this kind of monitoring. Just Say NO! You may want to think about mixing the BGV's from the sound console. You will have to train and train often. Have a quarterly training. No matter how much you train, users will not remember everything. Be patient and know that is the norm from now on. You are and forever will be the expert. Live it, learn it, love it. Almost 20 years ago I left my AVL & live production gig and joined a church staff. I have since been blessed to be on four church staffs; Saddleback, Mariners, South Hills, and Magnolia. It has been a journey filled with blessings and experiences I could not have ever imagined and I am truly thankful for it all. I have met so many new friends and it has been a true honor to serve with such amazing people, both staff and volunteer. All of this has led to my next adventure. In January I transitioned off church staff to become the Church Relations guy at CCI Solutions. I have big shoes to fill, as Duke DeJong has developed this position over the last four plus years. I am excited for this new challenge, helping churches to be great and helping leaders as they serve the bride of Christ. Sonja and I feel this is where my passion and experience collide. I'm staying in SoCal but may be in a city near you soon, so make sure to watch Social Media for my travel plans. Financing is in place and on track for the end of May. The architect has submitted the preliminary plans to the city, so the plan-check process has begun. This week we had our first real meeting with Pastors, Ministers, and Department Directors. Assignments were finalized and distributed amongst the staff. Clean out and purging of the building has also been happening. This weekend we are having the final yard sales that will sell off furnishings, costumes, and a giant pile of things that the church collected over the last seventeen years. Most people do not realize how much has to be sorted, moved, sold, and thrown away just to have a large building ready for a major remodel. Another aspect of this remodel is that we will continue to have services on Sunday in the auditorium. While it would have been easier to move out, we do not really have that option in our current setup. AVL system will be on a week to week basis with FOH and video becoming portable for the duration on the project. We will use the current speaker and projector system as long as we can and then move to a completely portable rig when that becomes necessary based on the construction schedule. Next week we will finalize the AVL systems and electrical first pass. These are just some of the phrases many a technical professional has uttered under their breath during an event that is going, shall we say, not so smoothly. I have been a part of, as well as witness to, many events that had very bad transitions. Well thought out and well planned transitions are crucial to any live event. They are, in my opinion, even more crucial in a church service. A great church service is designed to move the attendees to a specific emotion, discipline, or realization; to engage in what is happening, to participate in an interactive way, to ingest insights and knowledge for living out a life in Christ, and to receive the knowledge of Christ’s redemption. A poor transition can pull people out of the very moment we are desperately trying to create for them. It can be so distracting that we lose them completely. Recently on CTW I had mentioned a Credit Card Reconciliation Form. So here is the template we have used. 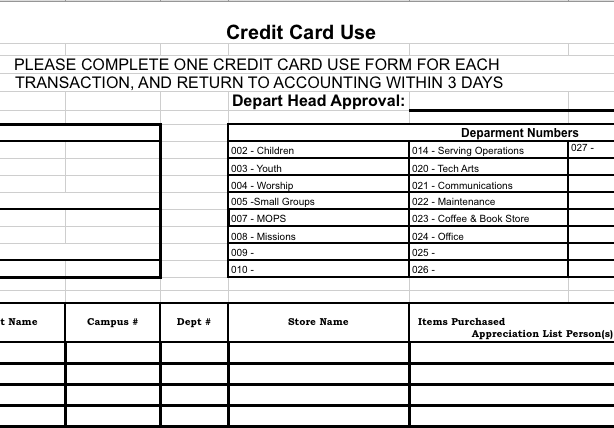 Click to Download the Excel template. This is part 4 of my 4 part revisit of some older posts. At most churches each musician brings their instrument of choice and the sound person is expected to mix and equalize all and any instruments into a glorious blend of celestial music. It is a true fact that you can’t make a silk purse out of a sow’s ear. In a later article I will address the need for the Music Pastor/Worship Leader to set and keep a standard for musical instruments that are onstage. As your congregation grows it is likely you will want the church to own the majority of key instruments you use on a regular basis such as drums and keyboards. The other part of the program material that can make or break the sound of your service is the singers. I realize that I am walking on glass when talking about this but it must be addressed. Which is worse: seven singers who are flat and not in key or three singers who are flat and not in key? You would be surprised at the number worship teams where the singing was bad the decision was made to throw more singers at the problem, but the bad singers only threw the new singers off. The last part of this element is the quality of musicianship ontage. This is more than just talent, the sound of your band or orchestra is also very dependent on the servant’s heart to submit to the Music Pastor/Worship Leader as they submit to the Senior Pastor. These four elements are the foundations for sound in any venue and they need to be addressed and incorporated into your church vision. It is very important that you never stop trying to achieve perfection in all these areas even though it may seem impossible, pressing toward that goal will constantly improve the quality of all you do at your church. This is part 3 of my 4 part revisit of some older posts. This is an area that plagues most churches because little attention is given to it while the building is being built. Note: A big sledgehammer can also help the acoustics of your building and although you might enjoy using it, it is not recommended as a long-term solution, so seek professional help on this one. This is part 2 of my 4 part revisit of some older posts. This is the most sensitive and important part of the sound system. People are the deciding factor in the sound equation. Most people that volunteer for the sound ministry at church have a great heart of service. They are content to be behind the scenes and never be mentioned. They spend long hours at rehearsals and practices for worship, skits, plays, women’s dinners, coffee houses, youth rallies and the like. They are also faithful to be at church, usually before anyone else to set up the stage, and the last ones to leave. Or Pastors who put a cable knit sweater over their lapel mic and wonder why they can’t be heard. Make no mistake about it, volunteer sound people are the unsung heroes of the church. The truth of the matter is that most sound people are professionals who work hard all week at their ‘real job’ and then serve in the sound ministry at night and on the weekend. Because of this, most people come into the sound ministry with a willing heart but not very much knowledge about music, sound or sound systems. This lack of knowledge breeds either the ‘tweeker’ who is always turning knobs but doesn’t really know what changes are being made or the ‘petrified rock’ who never touches anything on the mixer because they are afraid of messing something up. Both of these make for a challenging service and, most of all, lead to a VERY frustrated Pastor-worship leader-band-etc. This also leads to burn out on the volunteers part, because it creates stress and frustration on their part, as well. The answer to this question seems so obvious, but the sound system in each church was designed, purchased, and installed using very deferent criteria, one from another and many sound people have learned most of their audio knowledge with the sound system they work with every week. If this system is not properly set up from the start the operator’s ability to provide good sound is immediately compromised. 4.The program material (which includes the instrument quality, the talent of the musicians, and the arrangement of the songs). Let’s go through these one by one to see the reality. Most sound systems in contemporary churches were set up in one of four ways. 1. Components were donated from a band that is no longer together (or no longer practicing in their garage,) and their sound man (or lead singer) comes over, sets up the system, and in 15 minutes dispenses all his knowledge about how the system works. This meeting usually ends with him saying “Good luck!” and BAM! the church has a sound system. Note that generally none of the microphones for the worship singers are the same model or even the same brand and the system does not have any way to optimize it, like equalization (except on the channels of the mixer, which are only fixed high, mid, and low). Rereading this, I stand by the brutal reality…. 2. The music Pastor pours over industry magazines or websites then takes a fateful trip down to the local music store where he or she buys not what they want, but whatever the store has in stock because “there just isn’t any more time” or the budget does not permit. 3. The pastor or a well-meaning board member picks a sound company on line or out of the phone book, usually alphabetically, and has them bid a system based not on what will work for the church, but the budget. Usually in this scenario the music pastor and the existing sound people are not once consulted, but expected to operate with this system and perform flawlessly at the next service. This goes for the entire church building process, the first building is build on BUDGET and the second is built on PURPOSE. 4. One or two of the sound team members persuade the Pastor and board members to buy the equipment, usually out of a catalogue or on the internet, hanging speakers wherever and using microphone cable from their favorite consumer electronics shack in the mall. This system never works correctly but everyone is afraid to admit it. I will continue this thread with Part: 2 "The sound people." One of the reasons I became the TD at Magnolia Church (or “MAG” as it is affectionately known) last year was to help facilitate our upcoming auditorium-building remodel and build teams that could operate the new AVL system that will be implemented. As well as oversee I.T. and the rest of technology on the campus. Magnolia Church, formerly “Magnolia Avenue Baptist Church”, was founded in the mid 1950’s. The current auditorium or “Worship Center” was built in 1974 and remodeled in 1997. For 35 years Mag presented “The Living Christmas Tree”, as many churches did. Subsequently, the auditorium was built around that yearly performance, as it, by then, was a staple of the community. Several years ago, for many reasons, the LCT was retired and even though the church still has a special Christmas “performance” every December, the focus of the auditorium is not on that one event. The building has been well maintained but is just generally out of date in most all areas. Mag’s current weekend lineup is two “blended” Sunday services (choir and orchestra with rhythm section) and one “contemporary” (band and singers) service. Although we “mix it up” occasionally, we really have two styles of music each week. A renewed emphasis is being placed on who Mag wants to serve locally: its existing members, the surrounding community, and California Baptist University (directly across the street from the church). We will also be able to accommodate outside community events and church wide events more easily. A new ceiling system that will enhance the acoustics of congregational singing without detracting from the audio systems intelligibility. New seating to replace the current pews and add 50+ more seats (theatre style seating without armrests). All new acoustic treatment on stage, side walls, and rear walls. A rebuilt stage platform with permanent “thrust”. A complete Audio and Video systems upgrade, including relocation of the FOH position and the video control room. Updating the existing lighting system and relocating/ adding lighting positions. This will also include LED house lighting. Re-Model/ expansion of the lobby, entrance areas and Restrooms. Re-Model of the fellowship hall and kitchen, which includes all new A.V. Re-Model/ expansion of the outside guest areas including a coffee bar and seating area. All new signage and way finding. We have already been in the planning stages of this project since mid 2013. As of this post the Architects, Electrical Engineers, and AVL Designers/Consultants are finalizing their designs for submittal to the planning department for permits and such. We hope to be started with construction at the end of April. We will, for the majority of the project, continue to occupy the building during construction (at least on the weekends). Most of the events that happen during the week will be moved to our other buildings. Each month I will be giving you an update on the remodel, so stay tuned. The Adventure begins! Church Tech Leaders "Working In Your Strengths"
"I’ve been doing a lot of thinking lately about working in my strengths. Like many of you, I have many strengths that pertain to the tech world. For me, the two at the top are 1) being a good troubleshooter, and 2) being a people person/ people encourager. Both of these have served me well over my career in tech and life in general. I’m also a dreamer, creator, and builder. And, even though I can be sarcastic and dark, deep down I am actually an optimist, a “glass half full” kind of guy. The latest economic down-turn was tough on everyone, while I have my views on economics, politics, and faith during hard times, I will save those for another post. Everyone has been affected, and those of us on church staffs are no exception. Like any company, a church has bills to pay and mouths to feed. Economic down turn = people having less money = giving goes down = church budget gets cut = layoffs… well you all know the drill...."